ON THE FRONT: Loteria Posters! Here are my two new limited-edition Loteria posters that will be debuting at Detcon1 and San Diego Comic Con this month! 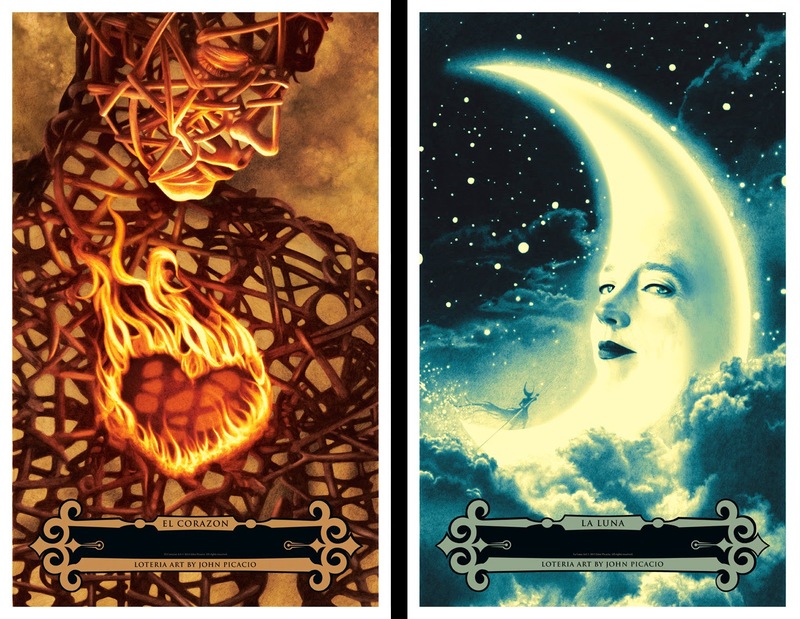 "El Corazon" and "La Luna" measure 11" x 18", and are printed on thick cardstock. Each can be yours for only $20. There will only be 500 of these available, and they will NOT be for sale online for the foreseeable. How do you get yours? Come see me at my signings + special events at the following conventions. First come, first serve! Saturday, July 26 / After "Spotlight on John Picacio", which begins at 1pm (Room 4) / I'll be signing in the Autograph Area in the Sails Pavilion after this panel. If you're not attending any of these events, my best suggestion is see if you have any friends that are, and ask them to purchase the items for you. I'll be posting updated details on each event, and the locations and times where I'll be signing and selling these.